The first thing that comes into my mind about the Sherlock Holmes series of Granada Studios is that it was of high standards. Great scripts, wonderful cast, locations chosen with elaboration and authenticity all marked the production. In this article I would like to deal with the four-legged cast of the stories – I make an attempt to list the dogs who appear in the series (horses were also very important in the Victorian era as riding horses, as helpers in agriculture and they were essential in transportation. One of them, a certain Silver Blaze was the main character in an adventure.). Dogs are men’s faithful companions long ago. They help and protect us, are true friends and make life more tolerable. There are many famous dogs in literature, like Eric Knight’s Lassie (Lassie Come-Home, 1940), the dogs of Jack London, namely Jerry, Michael and Buck (Jerry of the Islands, 1917, Michael, Brother of Jerry, 1917, The Call of the Wild, 1903) or Virginia Woolf’s Flush (Flush: A Biography, 1933). 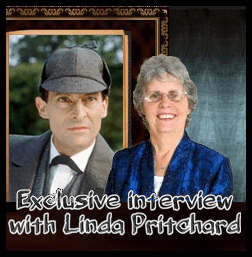 Jeremy Brett loved dogs and horses – you can see examples for both in the series. He owned horses and dogs when he was a child. Later he had a Jack Russell terrier called Mr. Binks, whose death deeply moved him. His second Watson, Edward Hardwicke was a dog-lover too. In the series there are adventures, where dogs appear even if Doyle did not write a word about them. Maybe this is because not just the main actors, but most members of the crew were fond of animals as well. In detective stories dogs help the police solving crimes. The situation is the same in some cases of Holmes. I begin the list of stories with the two most well-known mysteries, and after that I keep the original order of screening. I will note when there is some difference between the original novels and the actual episodes. The title hero of the adventure is a bloodthirsty beast from a family legend. 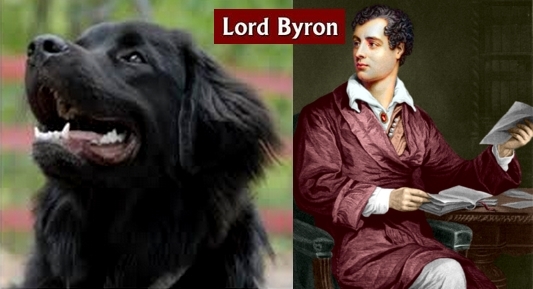 Doyle describes the animal as follows: „a huge, black dog, larger than any hound that ever mortal eye has rested on”. We do not know more about its breed, just that it is some kind of a mutt, extremely big and wild. But there is another dog in this story, a much tamer than the famous Hound – Spot, the cute spaniel of dr. Mortimer. Unfortunately the lovely companion becomes the victim of the beast. The dog of this story is on the side of the good – it is Toby, the tracker. According to Doyle „Toby proved to be an ugly, long-haired, lop-eared creature, half spaniel and half lurcher, brown and white in colour, with a very clumsy, waddling gait.” The production chose a sweet animal actor for the part. Toby’s legendary nose puts Holmes and Watson on the tracks of Jonathan Small and Tonga. The pet of Lady Brackenstall, Fudge is mentioned indirectly in the story. Poor animal is killed by her rude and violent husband. Interestingly the scene where Holmes finds the collar and the broken tombstone of the dog is missing from the novel. Mentioning the cruelty towards the dog confirms the harshness and depravity of the murdered Lord Brackenstall. You do not find any dogs in the novel. It seems like keeping dogs was an integral part of peaceful and contented country life. Neville St. Clair and his wife keep two nice golden retrievers, who sadly have no further role in the unfolding of the story. „The curious incident of the dog in the night-time” is crucial in clearing up the case of the missing horse. The dog who did nothing is a border collie. The dog of Charles Augustus Milverton is only mentioned in a half sentence in the novel. (As Holmes says: „a beast of a dog which roams the garden”). In the filmed version the animal is a nice mastiff called Maximilian. Maybe it is more than a mere coincidence that Milverton keeps a mastiff, just like another oppressive figure of the Canon, Mr. Rucastle. Robert Ferguson’s dog, Carlo becomes the endurer of a cruel and painful test in this adventure. His condition meets the eye of Holmes and with its help he is able to solve the mystery. The episode is a fusion of two stories, namely The Three Gables and The Three Garridebs. My opinion is that it is not a successful adaptation, but it is challenging because a dog appears in the filmed version. It is a Saluki, on which Langdale Pike, who studied at the same university as Holmes, tests the detective’s deductive skills. Victor Savage and his wife keep two spaniels, who are very charming but they have nothing to do with the case. I would like to mention those stories that had not been filmed but dogs appear in them. When they meet for the first time, Watson mentions:”I keep a bull pup.” But the dog never appears again in their long row of adventures – it seems like Doyle forgot that he made the good doctor a dog owner. There is another dog in this story – that poor animal, on whom the unidentified pills are tested. I would like to end this writing with one of the most beautiful poems that was written about dogs. I never knew but one,--and here he lies.
" Dogs in the Granada Sherlock Holmes series "